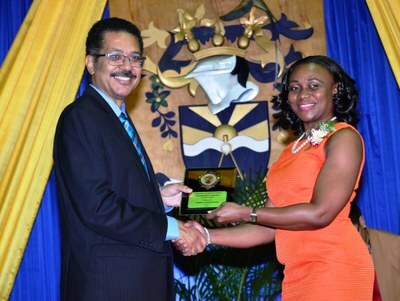 UTech, Jamaica Staff Honoured at 47th Annual Awards — UTech, Ja. Prof. Stephen Vasciannie, CD, President, UTech, Jamaica addresses members of faculty, staff and specially invited guests at the 47th annual University Awards ceremony held Friday, May 26, 2017 at the Alfred Sangster auditorium, Papine campus. 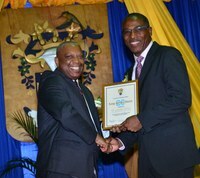 Members of faculty, administrative, technical and ancillary staff were honoured for long and dedicated service and commitment to the development of the University of Technology, Jamaica (UTech, Jamaica) at the 47th annual University Awards ceremony held on Friday, May 26, 2017 at the Alfred Sangster auditorium, Papine campus. Awards were presented for long service in the categories of 10, 15, 20, 25, 30 and 35 years; for excellence in research, community service, customer service, instructional excellence and innovation, as well as for excellence in ancillary, technical and administrative excellence. In congratulating members of faculty and staff, President, Prof. Stephen Vasciannie,CD reaffirmed the importance of teaching, research and service to the Institution and thanked persons “who have devoted their careers to the delivery in these core areas of the University.” The President specially singled out members of staff who have given 35 years of long service – Dr. Eugenie Brown-Myrie, Professor Vernon Buchanan and Mr. Ephraim Ramsay to the University. 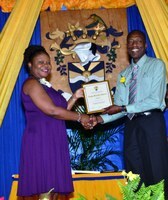 The President went on to highlight several examples of recent accomplishments in the University’s core areas. Among them, the signing of a contract with Petrocaribe in February 2017 for the delivery of the training component of a renewable energy pilot project at Glenmuir High School in Clarendon, and a $5 M research and scholarship partnership with Petroleum Cooperation of Jamaica (PCJ) for selected students in the School of Engineering to execute research and engineering capacity building projects annually, both led by Dr. Noel Brown, Head, School of Engineering. Prof. Vasciannie also highlighted recent publications by lecturers and administrators Dr. Jeanette Bartley-Bryan, AVP, Open and Distance Learning, Dr. Gaunette Sinclair-Maragh, Head, School of Hospitality and Tourism Management, Dr. Girjanauth Boodraj, Associate Professor, College of Business and Management and Mr Ian McGowan, Lecturer, School of Computing and Information Technology. In the area of service and outreach, the President commended members of faculty, staff and students who have been engaged in a number of community service projects. He pointed to the recent successful Papine Wellness Fest series led by the Department of Community Service and Development and health fairs led by the College of Oral Health Sciences. Prof. Vasciannie further provided the large gathering with updates on recent and pending changes in senior leadership, infrastructural upgrades on the Papine campus, as well as updates on the progress of the University’s application for Institutional Accreditation. 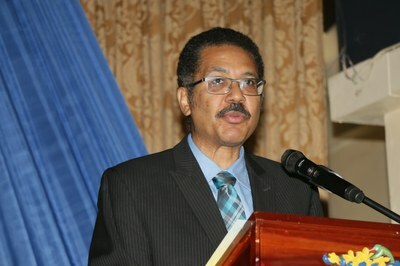 In pointing the way forward he urged staff to improve on student friendliness, increase research and publications, increase productive partnerships and increase on workplace productivity and the management of scarce resources. 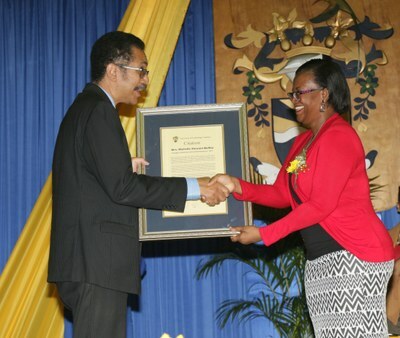 Dr Denise Daley, Lecturer, College of Health Sciences accepts her citation for the President’s Award for Excellence in Research from Prof. Stephen Vasciannie, President. 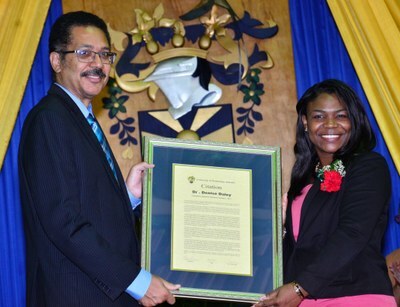 The citation lauded Dr. Daley for her research work that has largely been devoted to unlocking the medicinal properties of Jamaican plants and exploring their potential in the treatment of diseases which currently impact Jamaica, in particular diabetes, hypertension and cancer. 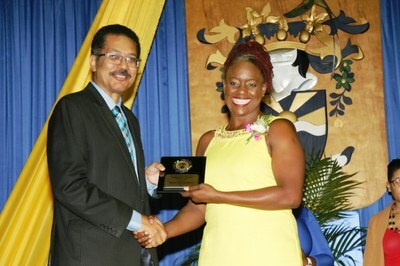 A beaming Mrs Michelle Stewart-McKoy, Lecturer, School of Humanities and Social Sciences, Faculty of Education and Liberal Studies accepts the President’s Award for Instructional Excellence from President Vasciannie. The citation lauded Mrs. Stewart-McKoy for her track record in the use of technology in learning and for excellence in the teaching of English, Spanish and Web Interactions. 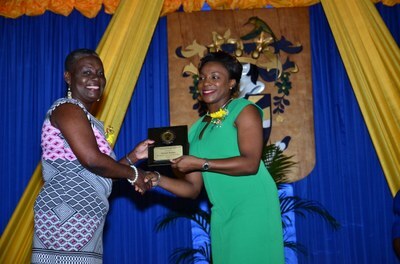 Mrs. Sharon Anderson-Roach, (left) College Administrator, College of Business and Management and Mrs Nadine Lynch-Clarke are a picture of happiness as they are each presented with the President’s Award for Excellence in Innovation from Prof. Stephen Vasciannie. The award for innovation recognizes members of staff for use of innovation in improving University procedures that enhance customer service and serve to improve workplace safety and wellness. 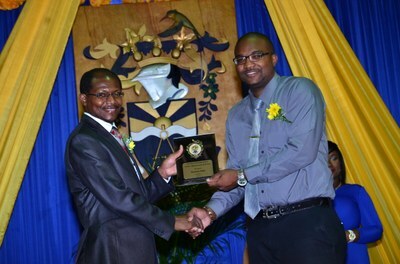 The COBAM administrators received the award for their use of technology in implementing a Student Relations Management System(SRMS) which has significantly enhanced customer service in the College. Among its features are direct emailing to students, direct link to SITS:Vision and to LIMS and logging of customer queries by students. Dr. Carol Archer, Associate Professor, Faculty of The Built Environment wears a beautiful smile as she accepts the President’s Award for Excellence in Community Service from Prof. Stephen Vasciannie. Dr. Archer was honoured for tirelessly working to establish linkages and for fostering goodwill between faculty, staff and students and the wider community. Among her many spearheaded projects that has given back to the community is the on-going Papine University Town Project. 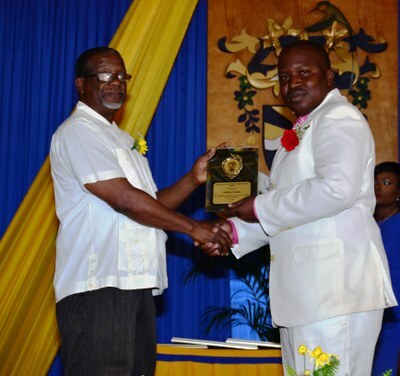 Prof. Vasciannie (left) presents the President’s Award for Excellence in Customer Service to Mr Pedro Lawrence, Maintenance Officer, Facilities Management Department. 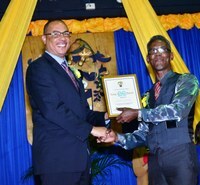 Mr Lawrence was honoured for high standards of professionalism and going above and beyond the call of duty in the execution of his duties. 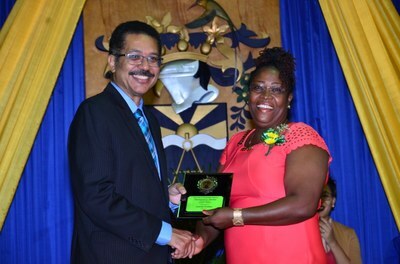 Administrative Excellence: Miss Deborah Foreman, Administrative Support in the Faculty of Engineering and Computing receives the President’s Award for Administrative Excellence from President Vasciannie. Miss Foreman was acknowledged for excellence in customer service provided to students and staff and for going the extra mile on behalf of students’ welfare. 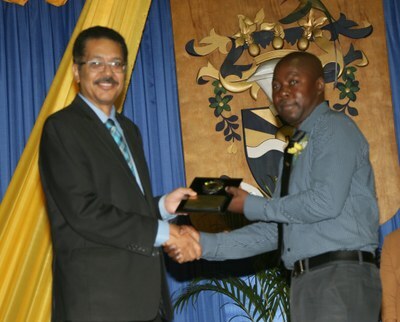 Technical Excellence: Prof. Vasciannie (left) presents Mr. Adrian Wray, University Graphic Artist with the President’s Award for Excellence in the Technical Category. Mr Wray was awarded for his work in the design of University publications which ultimately contribute to the Institution’s public image. 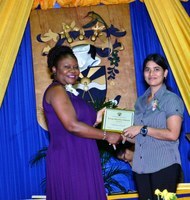 Ancillary Excellence: Prof. Vasciannie presents Miss Loretta Gordon, Office Attendant with the President’s Award for Ancillary Excellence. 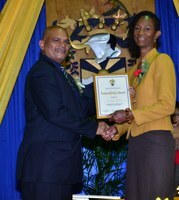 Miss Gordon was acknowledged for consistently going beyond the call of duty in executing her duties. 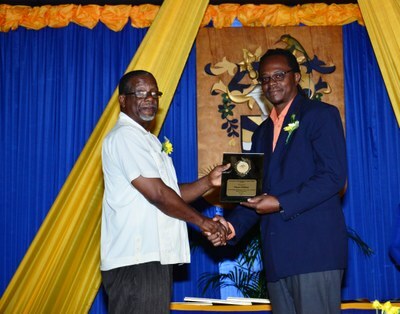 Prof. Colin Gyles, (left) Deputy President, presents Mr Ronald Sutherland, President, UTech, Jamaica Alumni Association (Jamaica Chapter) and General Manager of FYAH 105 FM with the Distinguished Past Student Award. 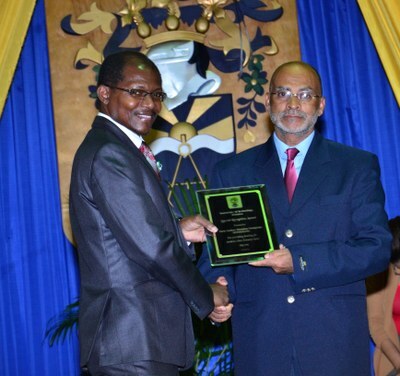 The citation on Mr Sutherland, who is also a member of the University’s Council, praised him for his valuable contribution of service to UTech, Jamaica and for his role in the development of the alumni association and the wider University community. Over the years, he has also provided representation on College and Faculty Boards, helping to shape the development of relevant academic policies and curricula and frequently assists the Human Resources Management Department as a member of the recruitment panel for senior posts. 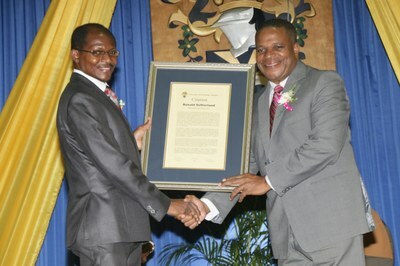 Prof. Colin Gyles, (left) Deputy President presents Mr Glendon Johnson, Director of Human Resources at the West Indies Alumina Company (WINDALCO) with the Special Recognition Award in acknowledgement of his company’s funding support through scholarships for UTech, Jamaica students since 2007. Over the last ten years, WINDALCO has provided in excess of $6.4 M to final year students in the School of Engineering in the degree and diploma courses of study. Special recognition awards were given by each of the three Unions. 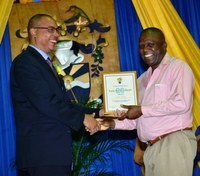 UTASU: Mr Leebert Langley (left), Vice President University of Technology, Jamaica Academic Staff Union (UTASU) presents Mr Patrick Reid, Lecturer, College of Business and Management with the award for outstanding service to the Union. 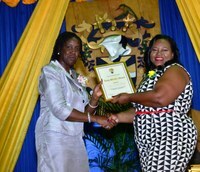 UTASA: Mrs Janet Grayson, (left) Vice President University of Technology, Jamaica Administrative Staff Association (UTASA) and Administrative Support, School of Computing and Information Technology presents the award for dedicated service to the Association to joint recipients Miss Akeilyah Bukley Administrative Support 2, Procurement and Office Services and Miss Marvette Hall, Administrative Support 2, School of Engineering. UAWU: Mr Osmond Campbell, (left) Negotiating Officer, University and Allied Workers Union (UAWU) presents awards for outstanding contribution to the recently concluded Heads of Agreement, to joint recipients Mr Anthony Gordon, Plumber, Facilities Management Department and Mr Clayton Williams, Lab Technician, School of Engineering. 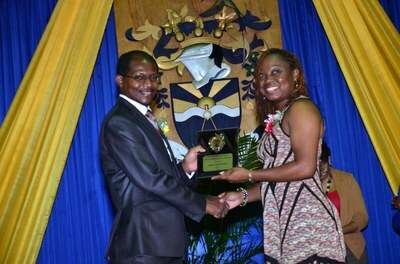 Pro-Chancellor, Mr Richard Powell presents awards for thirty years (30) of service to the University to a beaming Dr Eugenie Brown-Myrie, Associate Professor, College of Health Sciences and Mr Ephriam Ramsay, Lab Assistant, Faculty of Education and Liberal Studies. 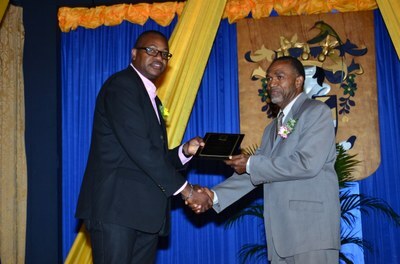 Pro-Chancellor, Mr. Richard Powell (left) presents 30 year long service awards (from left) to Mrs. Richele Harvey, Head of Division, Calvin McKain Library, Mr Winston Piper, Lecturer, School of Hospitality and Tourism Management (SHTM) and Dr. Copeland Stupart, Senior Lecturer, School of Building and Land Management (SBLM). 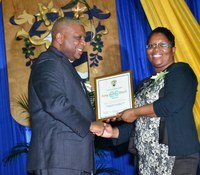 Dr. Elaine Wallace (left), University Registrar presents awards for twenty-five (25) years of service to (from left) Mrs. Maxine Bernard-Mitchell, Office Attendant, Facilities Management Department, Mrs Claudette Hisby, Student Affairs Administrator, School of Business Administration and Dr. Everton Lewis, Lecturer, Faculty of Education and Liberal Studies. 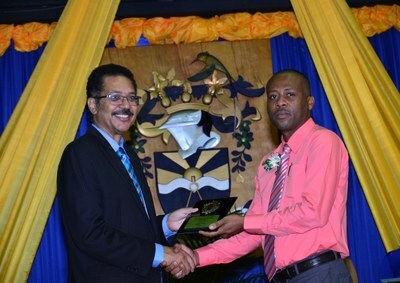 Dr. Sean Moncrieffe, (left) Vice-Dean (Acting), College of Health Sciences presents awards for twenty (20) years of service to Mr. Colin Davis, Director, Professional Studies, UTech Academy and Mr. Stedson Coward (right) Store Keeper, Facilities Management Department. 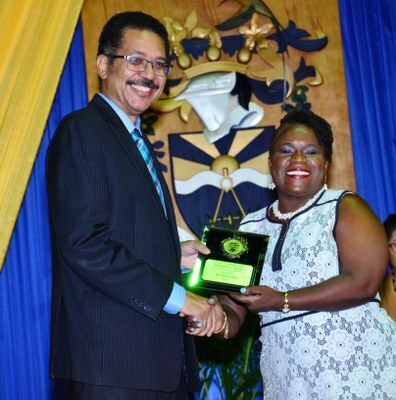 Mrs. Ava Sewell-Williamson, Lecturer, School of Hospitality and Tourism Management and Dr. Garfield Young, Dean, Faculty of The Built Environment happily accept their awards for twenty (20) years of service presented by Dr. Paul Golding, (left) Dean, College of Business and Management. Mr Paul Brissett, Chief Business and Finance Officer (CBFO) presents long service awards for 15 years of service to Dr. Hope Mayne, Lecturer, Faculty of Education and Liberal Studies and to Dr. Valeri Pougatchev, Senior Lecturer, School of Computing and Information Technology. 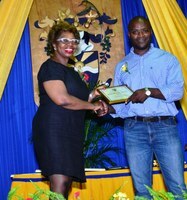 Mr. Linton Calder, Lab Technician, Faculty of Science and Sport accepts his long service award for 15 years of service from Dr. Patricia Green, Head, Caribbean School of Architecture (CSA). 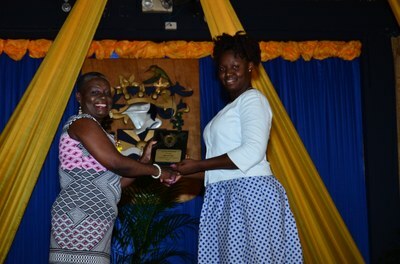 A radiant Mrs Magie Walker-Burton (right), Office Attendant, Facilities Management Department receives her 15 years of service award from Miss Karlene Black, Vice-Dean, Faculty of Engineering and Computing. Mrs Denise Stephenson-Hammil, Senior Director, Planning and Operations presents long service awards for ten (10) years to Mr Denvil Allen, Lab Technologist, School of Computing and Information Technology and Mrs. Leena Dasari, Lecturer, College of Health Sciences. 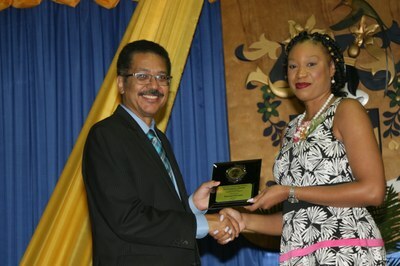 Mr David Drysdale, University Librarian presents Mrs Maxine Gordon, Senior Financial Accountant, Finance and Business Services with her award for ten (years) of service to the University of Technology, Jamaica. 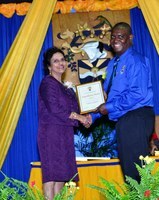 Mr Eustace Stewart, is a picture of happiness as he receives his long service award for ten (10) years from 15 years of service award from Dr Ruth Potopsingh, Associate Vice President, Sustainable Energy. 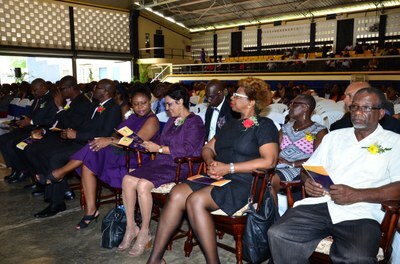 Congratulations to all Long Service Awardees. The full list is presented below.